Nothing goes wrong with aloo's and am pretty sure, this dish is everyone's fav. One time, I made this dish for a potluck party and everybody liked it. The highlight of the dish is, that it is being slowly cooked over a slow flame in the yoghurt mixture with all the spices. And when u taste ,each potato will be infused with all the flavours and the yoghurt y taste and wow, thatz the real beauty of this dish.. So, here comes the splash..
Baby Potatoes -- 6 to 8 nos. Cinnamon stick -- 1/2 " ,Cloves -- 1 no. , Cardamom -- 1 no. , Black Cardamom -- 1 no. -- Dry roast and grind to a fine powder and measure about 1/4 tsp and use. Boil the potatoes until they are fork tender and allow them to cool. Peel the skin and prick them using a toothpick in several places. Heat a tsp of butter and fry the boiled potatoes in medium low heat until they turn slight golden on the sides . Remove from the heat and let it cool. Grind the soaked cashews using very little water and make fine paste. Heat the pan with oil and saute the onions for 4 to 5 minutes till they turn transparent and glossy. Let it cool for 5 minutes and grind them to a fine paste. Now comes the preparation of Dum aloo. Heat a pan with butter / oil and do the seasoning with cumin seeds ,bay leaves. Add the GG paste and saute well for a minute or till u get rid of the raw smell. Throw in the ground onion paste ,turmeric powder and scald well until the oil separate leaving the paste. Pour in the tomato puree and combine well. Cover and cook the masala over medium heat for 4 to 5 minutes. By the time , the raw smell of the tomatoes would have been gone and oil starts leaving the sides. Now mix in the red chilly powder, coriander powder, cumin powder , garam masala powder and the salt. Scald the masala in th emixture for one or two minutes. Now slowly add the fried potatoes and mix well. Add the cashew paste as well and let the masala sit in the dum for 2 more minutes so that the potatoes absorbs some of the flavour. Finally add the whisked yoghurt as the top layer and just stir once for mixing well. Top the masala with the crushed kasoori methi leaves. Do not disturb / stir the mixture. Let the masala be in the medium low heat for another 5 minutes and switch off. U may also add the finely chopped onion and tomato instead of the paste and puree. But ,by this way , the quantity of the gravy as well as the taste is good in my opinion. Adding kasoori methi at the end gives edgy taste to the masala. I've added store bought garam masala per my family's taste since the freshly grounded spice powder has strong and bold flavour. Adding cashew paste is solely to give richness for the gravy. 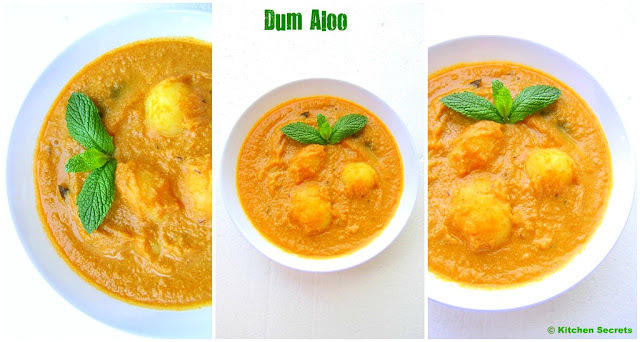 This is one colorful looking dum aloo Sho.. so good..
Dum aloo looks so rich and creamy,nice recipe I will try with chapathi. lovely aloos ! they look yummilicious !! Looks absolutely delicious and perfect.. beautiful pictures dear.. gr8 job !! The sauce looks so rich and creamy. Such a vibrant colour. My favorite one ..looks so creamy and yummy..gr8 combo with puri.. Seriously you are killing me with ur fabulous dum aloo, never say no to this extremely addictive and delicious curry..
looks so creamy !! perfect with rotis !! love the colour & recipe!! super delicious...will love to have with chapathi.. Very rich and delicious gravy! Loved the colour...n richness of gravy. Nice clicks..
looks creamy rich and well prepared and presented! That looks so delicious with the creamy yummy gravy !!! Love the colour of your gravy sounds so yumm! Nice photography! Rich and delicious dum aloo.....soo yumm!! Rich and delicious dum aloo....yumm! !